I fell in love with this skirt the moment I saw it. I love that the geometric print runs into itself and is a little off kilter, and I have continued to love the black and white trend and I still see it everywhere in fashion. The skirt I am wearing is a Size 24 which is a little big and I have it pinned, but the Size 22 was a little small. I am wearing it backwards because I like the way the print falls better, and since it is a pencil skirt, back or front do not matter. The eyeglasses are vintage and just like the ones Doris Day wore in Caprice. 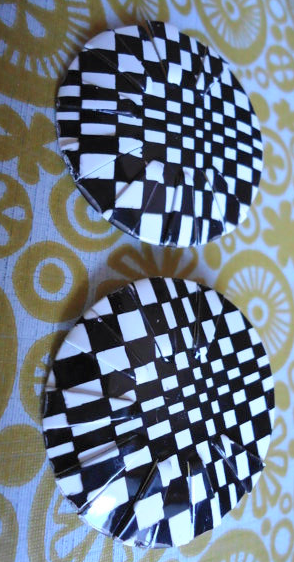 I found the earrings on Etsy, and they were just vintage round checkered tin earrings that someone had made cuts into, so that the pattern was uneven. I was so amused that they were as off kilter as the skirt that I bought them. And I suspect you will see me use that trick again. In addition they were stud earrings, and about ten years ago my ears started rejecting metal, so now I only wear clip earrings. Thus, I cut off the stud and replaced it with a set of clips, attached with my favorite glue E600, which it seems like I use everyday. To compare my measurements to yours, click HERE. I was an attorney before I retired two years ago and Catherines was my go-to store. 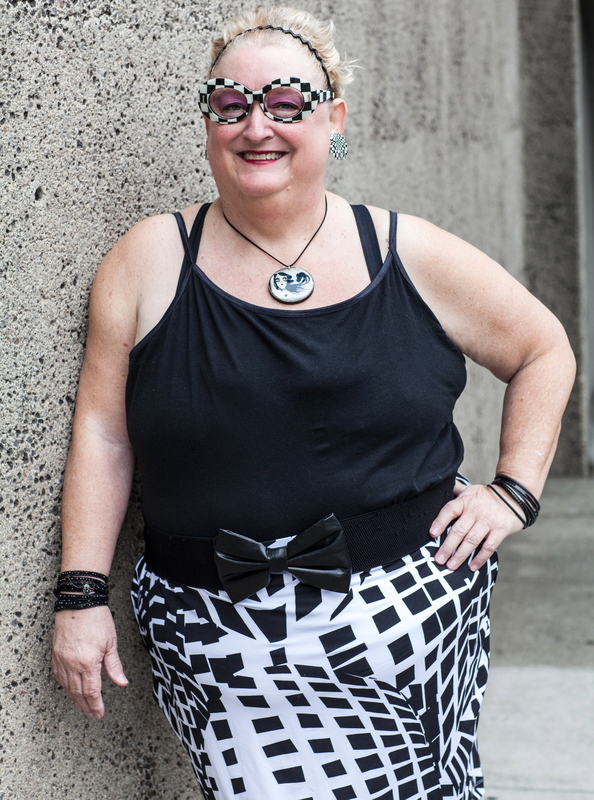 I have been a size 26/28 since at least 1990, just one size larger than most plus size retailer carry, and Wear to Work line was a life saver for me, since they carried up to a size 34W. Before the on-line revolution, I would even drive a couple of hours in each direction to Sacramento from San Francisco, so I could be properly dressed for work (now they have a store just 20 miles from my home). You can imagine how thrilled I am to see Catherines Black Label line of clothes. 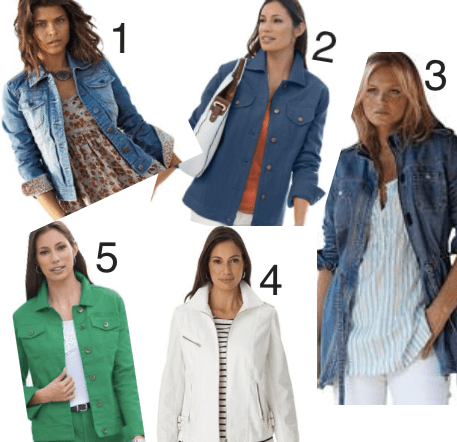 But of course since I an now retired and can wear whatever I want, and my favorites are the Uptown Quilted Jacket, above, which will be online on September 2nd, and the Rialto Lace Jacket, below. 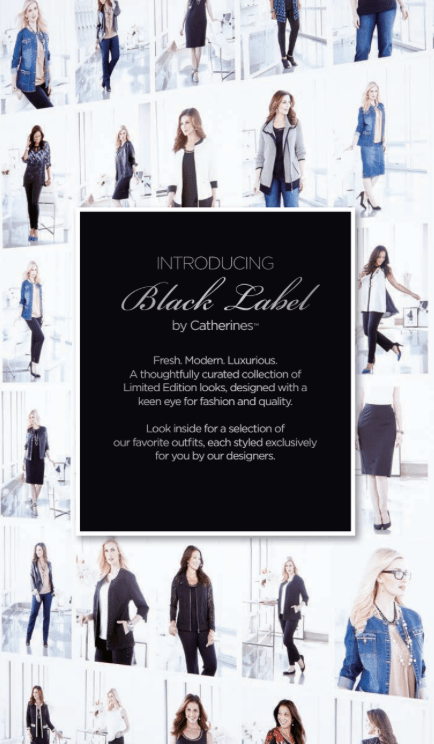 Catherines, a leading women’s plus size specialty retailer for sizes 16W–34W and 0X–5X, is excited to announce the launch of Black Label by Catherines, a limited-edition collection of statement-making fashions focused on quality, luxury and impeccable styling. Available in select stores and online at catherines.com beginning September 2, Black Label by Catherines offers plus size women the modern wardrobe options they crave, with exclusive pieces designed to fit beautifully. What differentiates Black Label from other plus size luxury collections is the focus on the higher end of the plus size range. 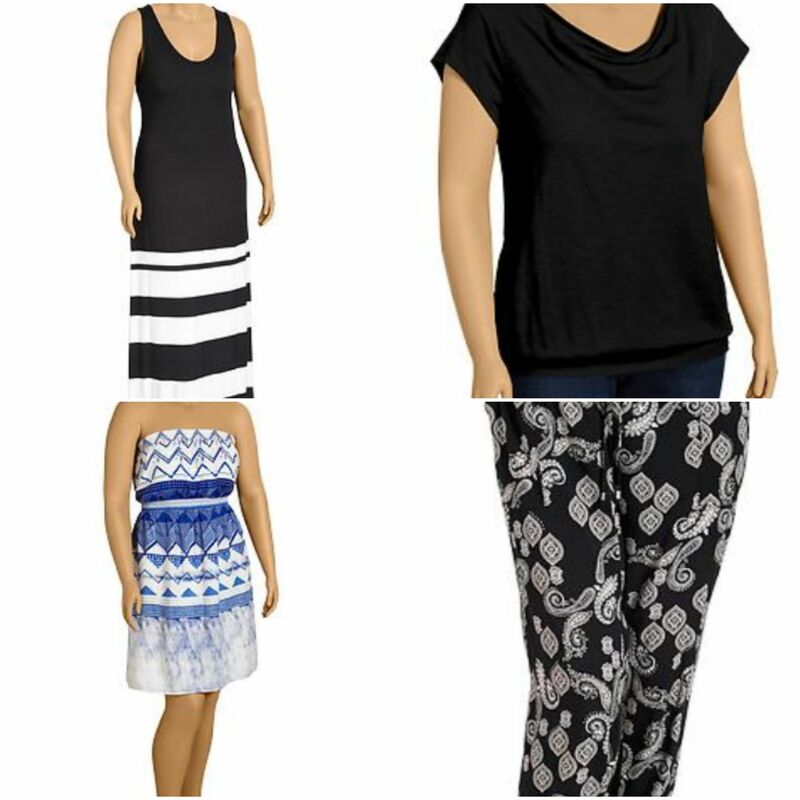 A number of retailers offer fashions up to size 22. But the Black Label collection gives full-figured women modern, luxurious looks up to sizes 34W and 5X. “It’s all about fitting women beautifully, while providing an elevated collection they just can’t get anywhere else,” says head of design, Kate McKee. “Our design team is dedicated to creating fresh looks that really flatter, within well-edited collections that are on-trend for every season. I am thrilled that I am seeing more high end, beautiful, fun clothes in extended sizes, and they have free shipping and easy returns to their local stores. They say denim never goes out of style, and that is certainly true for Fall 2014. Denim is everywhere this year. Funky, embellished or basic. I wear my denim jacket at least once a week, since it is often cold by the San Francisco Bay. Perhaps the August Issue of Plus Model Magazine was part of my inspiration. So when I saw all this denim at Jessica London I had to check it out! How cute are these cropped jean jackets? 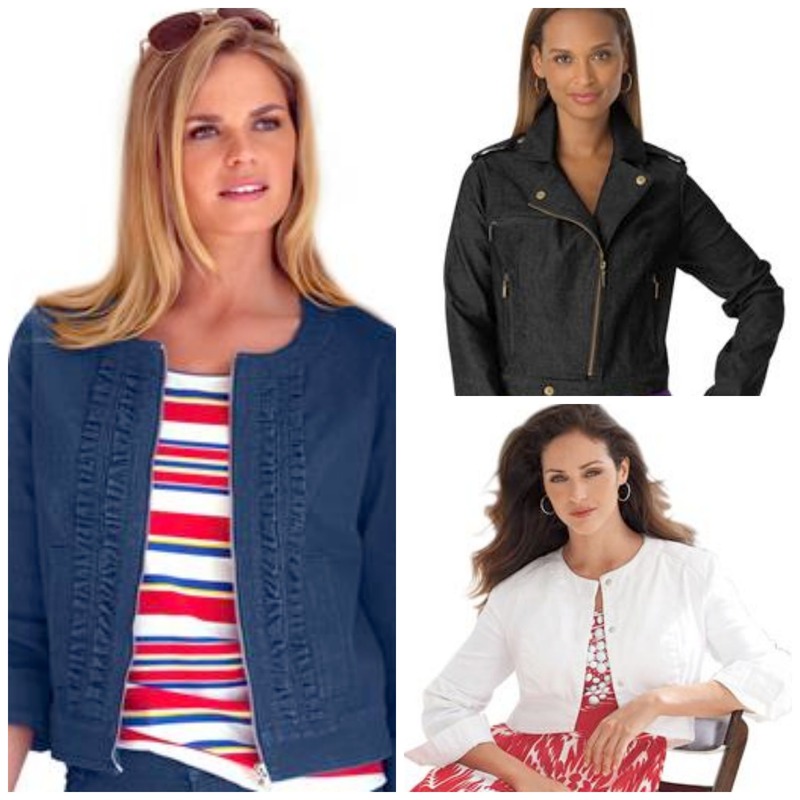 All very modern, one with ruffles, a moto jacket, and one with a zipper no less, and they are all on sale. 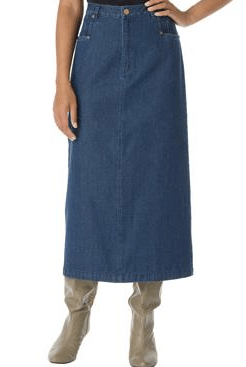 They come in various colors and come in sizes 28 – 32. Did I mention they are on sale? Pretty fun I say! And if those are too short for you here are five more standard length jackets. A couple come to a size 34W, and yes, they are also on sale! And if you love the jackets you might think you need the most popular skirt of the year to wear with them, a pencil skirt, in SO many colors. And Jessica London has more denim than I have ever seen on one place, much more than I could fit into this photo. Check it out, and yes they have lots of colors and many of their items come to a 28, and some to a 34W. And as you can see from the photo, many of them are on sale also. How fabulous is that? I suspect you already know I love jewelry. Big costume jewelry, fun and edgy costume jewelry, arty jewelry, lots of jewelry. If I leave the house without a necklace, bracelets and earrings I do not feel dressed. So I thought I would share some great plus size looks and are happening right now and trending through Autumn. I thought we would start with a favorite necklaces, that I wear all the time. It is a little kitschy and fun, and people love it, and under $30.00. I found three that I liked a lot at Just My Size. They all have that big look and can dress up any outfit, and guess what, they are each under $20. How fun is that? Then I found found four at Jessica London, also quite reasonable at under $30 each. These also have that big look that I love. I hope you like them too. And I cannot leave the subject of necklaces without discussing do it yourself (DIY). I made two this year, one funky steampunk necklace, and the other a huge statement necklace. It really is not any cheaper than buying something arty or unusual on Etsy, but every once in awhile I just feel the need to make something myself. Hot Topic Sale on Hell Bunny! I have not shopped at Hot Topic in years, BUT I saw someone post a Hell Bunny dress that they had gotten from them. When I went to check it out, most of them were on sale AND, SOME OF THEM ARE, Buy One Get One for $1. OMG! Hell Bunny Plus Size usually cost about $90.00 apiece, at Amazon, for example. Hell Bunny runs a little small in the waist for me, since I am an apple shape, but I just bought one from a friend that I know is going to fit because it has elastic all across the back, and I am going to look for other styles that are similar. Although not my favorite print, I can see from the “bacK” photo that this one has an elastic panel in the back, that may make it my first choice. Hot Topic also has some great graphic tanks to a 3X, but probably too small for me. 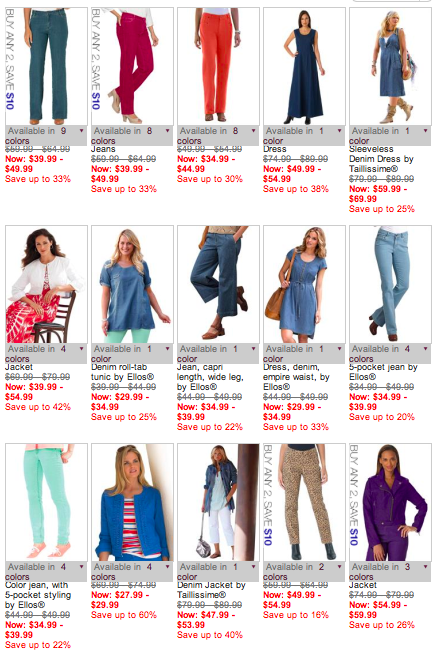 Old Navy is having a sale today, 25% of regularly priced items. That is a pretty good sale and I thought you might like to hear about it. Some of these are new items, some are basics. Of course, in addition to their regularly priced items being on sale, they have a sale section that is 15% off today. Some restrictions apply. Code for both is “onsavenow”. On-line only. And did you see the flip flops for a dollar a pair (in-store only)??? With a Burning Man identity of “Emerald” and finding myself blessed with a job at the headquarters in San Francisco I decided to splurge on a dress. It turned out not to be quite a splurge as this dress was on sale and I had a first-time-buyer discount. I paid a total of $23.90. I’m 5 feet tall and weigh ~210. I get a lot of compliments on this outfit. It’s comfortable and fun to wear. The only measurement I have a problem with is shoulder-to-shoulder and I need to go back and re-measure myself. The dress crosses from front to back too close to my shoulder and you can’t pull it in because of the design. I wear a blouse under it (most of the time anyway) as it is cut lower than I would wear it during the day. Overall I am thrilled to get a dress cut to size that I really enjoy. 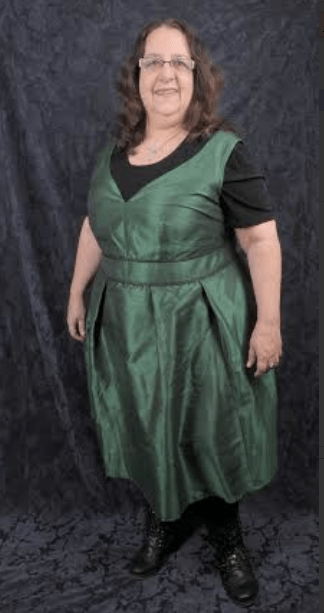 Thanks Emerald for taking the time to share with us how eShakti worked for you and you look fabulous in your dress. Recently my husband and I retired and we had to take a new approach to money. Money feels different when you have a limited income and we took it as an opportunity to live more modestly. When I met my husband, over 20 years ago, I was about $35,000 in credit card debt, and he helped me get on a budget and pay off my credit cards, and live in a cash world. So, what does that look like when you are a plus size clothing blogger. It means you find a way to buy clothes on sale, do some thrift shopping, or to take a “do it yourself” point of view, and I do all three. I found this sweater at Modcloth that I loved and thought would be very becoming, but since I had recently splurged on a Moto Jacket that I had been waiting to go on sale, I knew I was going to have to find a bargain. I decided thrifting was the way to go, but because I am even a little larger than a regular plus size, which is usually a size 3X/24, and I am a size 4X/26, I suspected that my local Goodwill or a regular thrift store was probably not going to work. So I knew my best option was to try on line. I recently wrote about shopping for vintage/pre-owned clothing in my size. 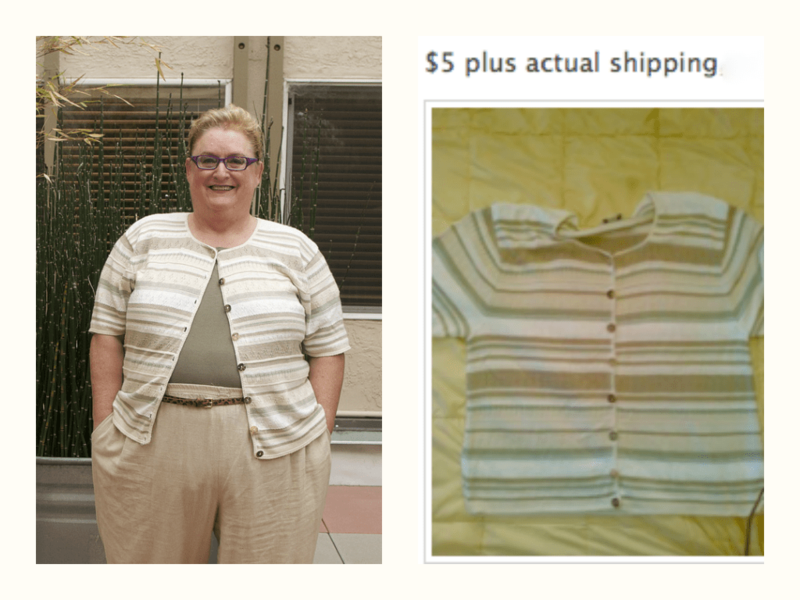 I started with ebay, because they have such a wide selection of clothing, but I did not have any luck, so I moved on to FatToo Grand for Size 28+, a group on Facebook where women can share clothing that is no longer working for them (it is a private group, you have to request entrance). The FatToo groups are not intended to make money for the creators of the group or the sellers, it is not a commercial venture. 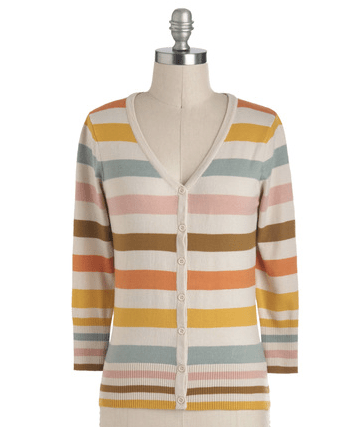 And guess what, I found this fun sweater, for $5 plus shipping. It is perfect for spring and that was an especially good price, and similar in style to what I was looking for. So it was a great savings, and it feels really good to get a good bargain. When I am thinking about making a purchase, I like to think in terms of what it would take to earn that amount, or what percentage of my income it will be. Will I love the clothes as much as it feels good to have savings and live within my budget? I was invited to participate in the “Splurge vs. Save” Campaign by writing this post, through Credit Card Insider. I loved their goals: “We are advocates of the responsible use of credit, building and managing your credit history, and making informed decisions when selecting a credit card.” Because it is work we all need to do in our lives. What do you think, do you love to get a great deal, and save some money for the future? I would love to hear more about your hunt for a bargain. Wearing whatever plus size fashion I want, whenever I want. Excited about glam, edgy or sophisticated, size 26/28. Love collaboration and DIY. Recovering attorney. 66 going on 16.